The November issue of Circuit Cellar magazine is coming soon. Clear your decks for a new stack of in-depth embedded electronics articles prepared for you to enjoy. Although 3D printing for prototyping has existed for decades, it’s only in recent years that it’s become a mainstream tool for embedded systems development. Today the ease of use of these systems has reached new levels and the types of materials that can be used continues to expand. 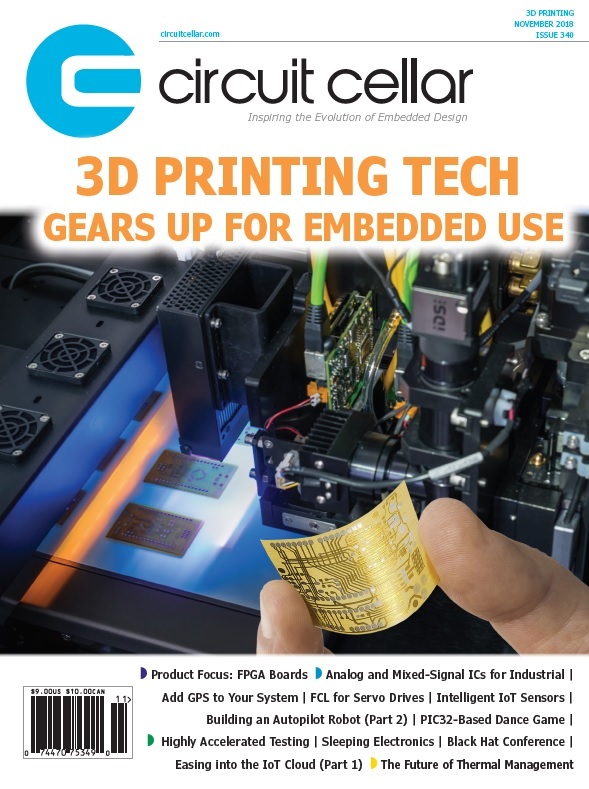 This article by Circuit Cellar’s Editor-in-Chief, Jeff Child looks at the technology and products available today that enable 3D printing for embedded systems. We certainly depend on GPS technology a lot these days, and technology advances have brought fairly powerful GPS functionally into our pockets. Today’s miniaturization of GPS receivers enables you to purchase an inexpensive but capable GPS module that you can add to your embedded system designs. In this article, Stuart Ball shows how to do this and take advantage of the GPS functionality. Servo drives are a key part of many factory automation systems. Improving their precision and speed requires attention to fast-current loops and related functions. In his article, Texas Instruments’ Ramesh Ramamoorthy gives an overview of the functional behavior of the servo loops using fast current loop algorithms in terms of bandwidth and phase margin. Analog and mixed-signal ICs play important roles in a variety of applications. These applications depend heavily on all kinds of interfacing between real-world analog signals and the digital realm of processing and control. Circuit Cellar’s Editor-in-Chief, Jeff Child, dives into the latest technology trends and product developments in analog and mixed-signal chips. Many of today’s electronic devices are never truly “off.” Even when a device is in sleep mode, it draws some amount of power—and drains batteries. Could this power drain be reduced? In this project article, Jeff Bachiochi addresses this question by looking at more efficient ways to for a system to “play dead” and regulate power. There’s a lot of advantages for the control/monitoring of devices to communicate indirectly with the user interface for those devices—using some form of “always-on” server. When this server is something beyond one in your home, it’s called the “cloud.” Today it’s not that difficult to use an external cloud service to act as the “middleman” in your system design. In this article, Brian Millier looks at the technologies and services available today enabling you to ease in to the IoT cloud. A new breed of intelligent sensors has emerged aimed squarely at IoT edge subsystems. In this article, Mentor Graphics’ Greg Lebsack explores what defines a sensor as intelligent and steps through the unique design flow issues that surround these kinds of devices. Microcontrollers are perfect for systems that need to process analog signals such as audio and do real-time digital control in conjunction with those signals. Along just those lines, learn how two Cornell students Michael Solomentsev and Drew Dunne recreated the classic arcade game “Dance Dance Revolution” using a Microchip Technology PIC32 MCU. Their version performs wavelet transforms to detect beats from an audio signal to synthesize dance move instructions in real-time without preprocessing. In part 1 of this two-part article series, Pedro Bertoleti laid the groundwork for his autopiloted four-wheeled robot project by exploring the concept of speed estimation and speed control. In part 2, he dives into the actual building of the robot. The project provides insight to the control and sensing functions of autonomous electrical vehicles. This month Colin O’Flynn summarizes a few interesting presentations from the Black Hat conference in Las Vegas. He walks you through some attacks on bitcoin wallets, x86 backdoors and side channel analysis work—these and other interesting presentations from Black Hat. It’s a fact of life that every electronic system eventually fails. Manufacturers use various methods to weed out most of the initial failures before shipping their product. In this article, George Novacek discusses engineering attempts to bring some predictability into the reliability and life expectancy of electronic systems. In particular, he focuses on Highly Accelerated Lifetime Testing (HALT) and Highly Accelerated Stress Screening (HASS). The September issue of Circuit Cellar magazine is coming soon. Clear your decks for a new stack of in-depth embedded electronics articles prepared for you to enjoy. Motion control technology for robotic systems continues to advance, as chip- and board-level solutions evolve to meet new demands. These involve a blending of precise analog technologies to control position, torque and speed with signal processing to enable accurate, real-time motor control. 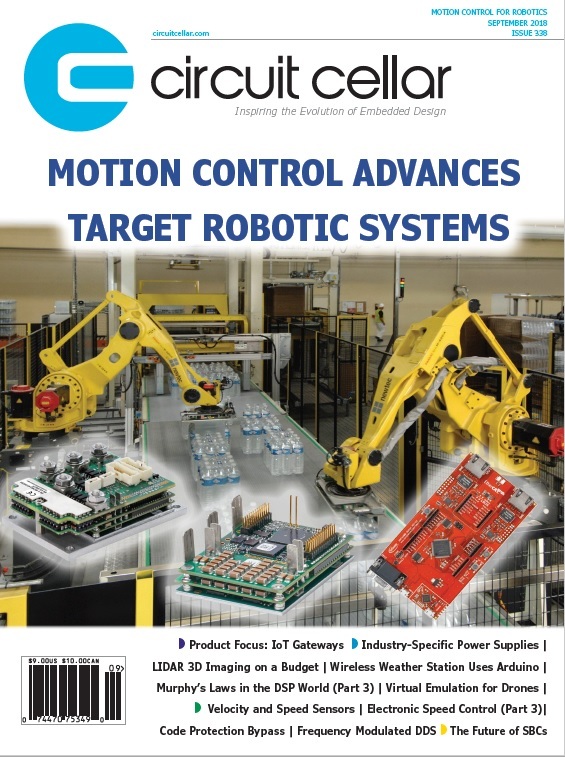 Here, Circuit Cellar’s Editor-in-Chief, Jeff Child, looks the latest technology and product advances in motion control for robotics. 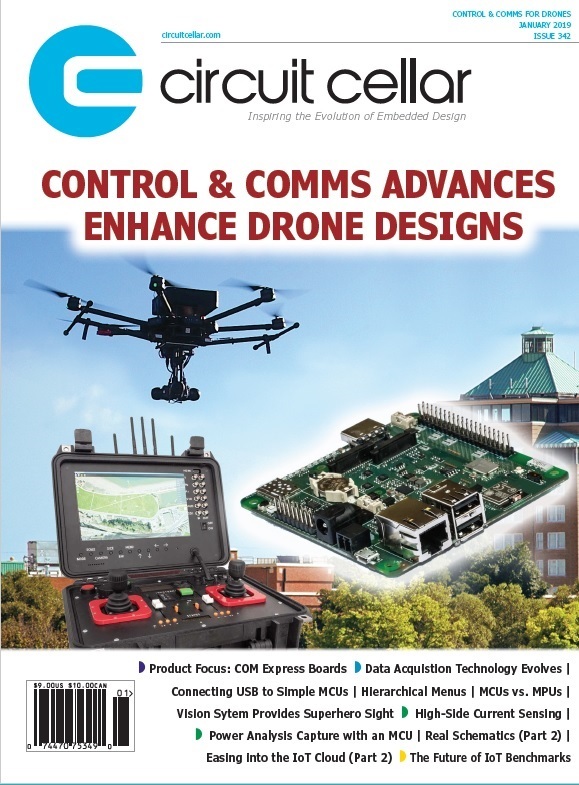 Radio-controlled drones are one among many applications that depend on the use of an Electronic Speed Controller (ESC) as part of its motor control design. After observing the operation of a number of ESC modules, in this part Jeff Bachiochi focuses in more closely on the interaction of the ESC with the BLDC motor. IoT gateways are a smart choice to facilitate bidirectional communication between IoT field devices and the cloud. Gateways also provide local processing and storage capabilities for offline services as well as near real-time management and control of edge devices. This Product Focus section updates readers on these technology trends and provides a product gallery of representative IoT gateways. Integrating wireless technologies into embedded systems has become much easier these days. In this project article, Raul Alvarez Torrico describes his home-made wireless weather station that monitors ambient temperature, relative humidity, wind speed and wind direction, using Arduino and a pair of cheap Amplitude Shift Keying (ASK) radio modules. Prompted by a reader’s query, Ed became aware that you can no longer get crystal oscillator modules tuned to specific frequencies. With that in mind, Ed set out to build a “Channel Element” replacement around a Teensy 3.6 board and a DDS module. In this article, Ed Nisley explains how the Teensy’s 32-bit datapath and 180 MHz CPU clock affect the DDS frequency calculations. He then explores some detailed timings. Sometimes power decisions are left as an afterthought in system designs. But your choice of power supply or battery strategy can have a major impact on your system’s capabilities. Circuit Cellar’s Editor-in-Chief, Jeff Child, dives into the latest technology trends and product developments in power supplies and batteries. Unpredictable issues crop up when you move from the real world of analog signals and enter the world of digital signal processing (DSP). In Part 3 of this article series, Mike Smith and Mai Tanaka focuses on strategies for how to—or how to try to—avoid Murphy’s Laws when doing DSP. Drone system designers are integrating high-definition video and other features into their SoCs. Verifying the video capture circuitry, data collection components and UHD-4K streaming video capabilities found in drones is not trivial. In his article, Mentor’s Richard Pugh explains why drone verification is a natural fit for hardware emulation because emulation is very efficient at handling large amounts of streamed data. Demand is on the rise for 3D image data for use in a variety of applications, from autonomous cars to military base security. That has spurred research into high precision LIDAR systems capable of creating extremely clear 3D images to meet this demand. Learn how Cornell student Chris Graef leveraged inexpensive LIDAR sensors to build a 3D imaging system all within a budget of around $200. Automatic systems require real-life physical attributes to be measured and converted to electrical quantities ready for electronic processing. Velocity is one such attribute. In this article, George Novacek steps through the math, science and technology behind measuring velocity and the sensors used for such measurements. Microcontroller fuse bits are used to protect code from being read out. How well do they work in practice? Some of them have been recently broken. In this article Colin O’Flynn takes you through the details of such an attack to help you understand the realistic threat model. The August issue of Circuit Cellar magazine is coming soon. Be on the lookout for a whole shipload of top-notch embedded electronics articles for you to enjoy. Long gone now are the days when FPGAs were thought of as simple programmable circuitry for interfacing and glue logic. 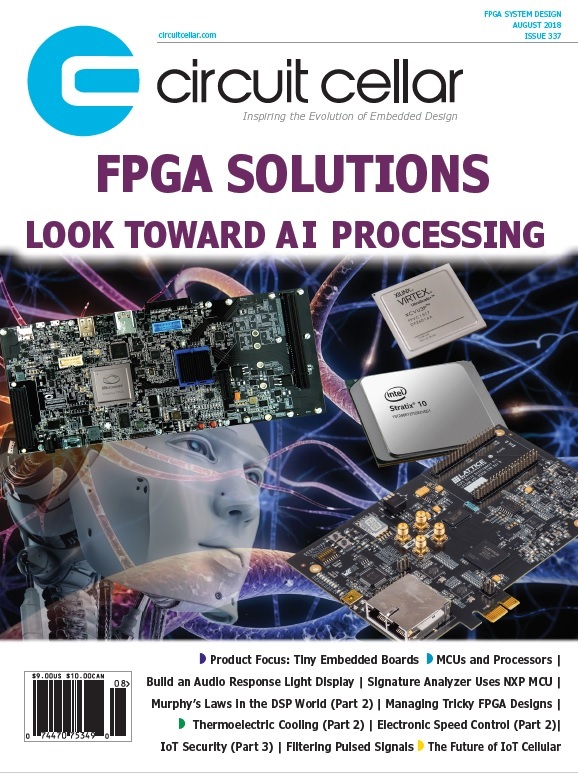 Today, FPGAs are powerful system chips with on-chip processors, signal processing functionality and rich offerings or high-speed connectivity. Here, Circuit Cellar’s Editor-in-Chief, Jeff Child, looks at the latest technology and trends in FPGA system design. Modern FPGAs can contain millions of logic gates and thousands of embedded DSP processors allowing FPGA hardware designers to create extremely sophisticated and complex application-specific hardware functions. 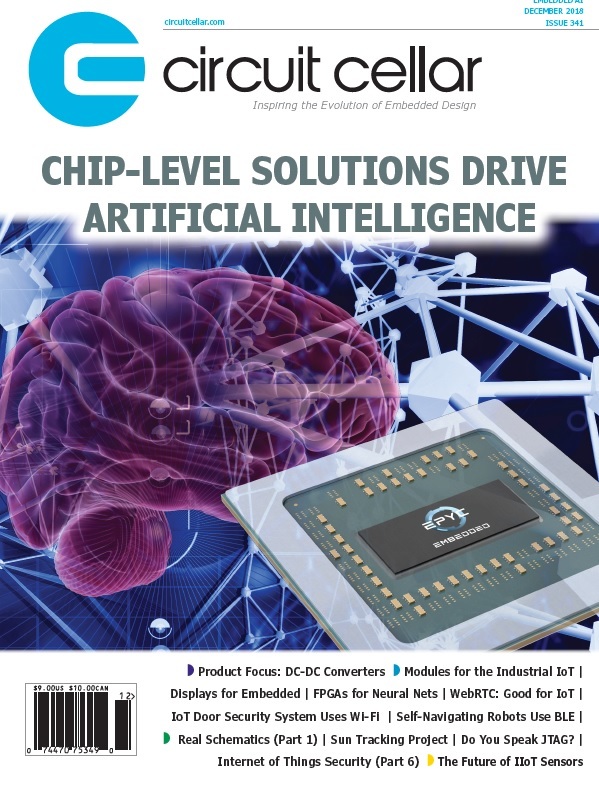 In this article, Pentek’s Bob Sgandurra explores how today’s FPGA technology has revamped the roles of both hardware and software engineers as well as how dealing with on-chip IP adds new layers of complexity. An amazing amount of computing functionality can be squeezed on to a small form factor board these days. These company—and even tiny—board-level products meet the needs of applications where extremely low SWaP (size, weight and power) beats all other demands. This Product Focus section updates readers on this technology trend and provides a product album of representative small and tiny embedded boards. Today’s crop of microcontrollers and embedded processors provide a rich continuum of features, functions and capabilities. It’s hard to tell anymore where the dividing line is, especially when a lot of them use the same CPU cores. Circuit Cellar’s Editor-in-Chief, Jeff Child, delves into the technology and product trends of MCUs and embedded processors. Many unexpected issues come into play when you move from the real world of analog signals and enter the world of digital signal processing (DSP). Part 2 of this article series by Michael Smith, Mai Tanaka and Ehsan Shahrabi Farahani charges forward introducing “Murphy’s Laws of DSP” #7, #8 and #9 and looks at the spectral analysis of DSP signals. Doing a signature analysis of a signal used to require an oscilloscope to display your results. In this article, Brian Millier shows how you can build a free-standing tester that uses mostly just the internal peripherals of an NXP ARM microcontroller. He described how the tester operates and how he implemented it using a Teensy 3.5 development module and an intelligent 4.3-inch TFT touch-screen display. Filtering pulsed signals can be a tricky prospect. Using a recent customer implementation as an example, Robert Lacoste highlights various alternative approaches and describes the key concepts involved. Simulation results are provided to help readers understand what’s going on. In Part 1, Jeff Bachiochi discussed the mechanical differences between DC brushed and brushless DC (BLDC) motors. This time he dives into basics of an Electronic Speed Controller’s operations and its circuitry. And all this is illustrated via his ESC-based project that uses a Microchip PIC MCU. Light shows have been a part of entertainment situations seemingly forever, but the technology has evolved over time. These light shows have their origin in the primitive “light organs” of the 1960s in which each spectral band had its own color that pulsed in intensity with audio amplitudes within its range of frequencies. In this article, Devlin Gualtieri discusses his circuit design that implements a light organ using today’s IC and LED technologies. In this next part of his article series on IoT security, Bob Japenga looks at how checklists and the common criteria framework can help us create more secure IoT devices. He covers how to create a list of security assets and to establish threat checklists that identify all the threats to your security assets. In Part 1 George Novacek described how he built a test chamber using some electronics combined with components salvaged from his thermoelectric water cooler. To confirm his test results, he purchased another thermoelectric cooler and repeated the tests. In Part 2 he covers the results of these tests along with some theoretical performance calculations.